From the Mississippi to the Pacific and from the Canadian to the Mexican borders, the BNSF Railway covers all the grandeur of the American West. Its 32,000 miles of track and fleet of 8,000 locomotives are the product of 160 years of empire building, mergers and acquisitions. Built into its DNA are the Santa Fe’s Super Chief, the Chicago–LA “Train of the Stars”; the Burlington Railroad’s Pioneer Zephyr, the first diesel streamliner; and the Northern Pacific Railway, “Main Street of the Northwest.” With three transcontinental routes, today’s BNSF is the second-largest freight railway in North America, carrying everything from Far East container traffic to Midwest grain to Texas oil. 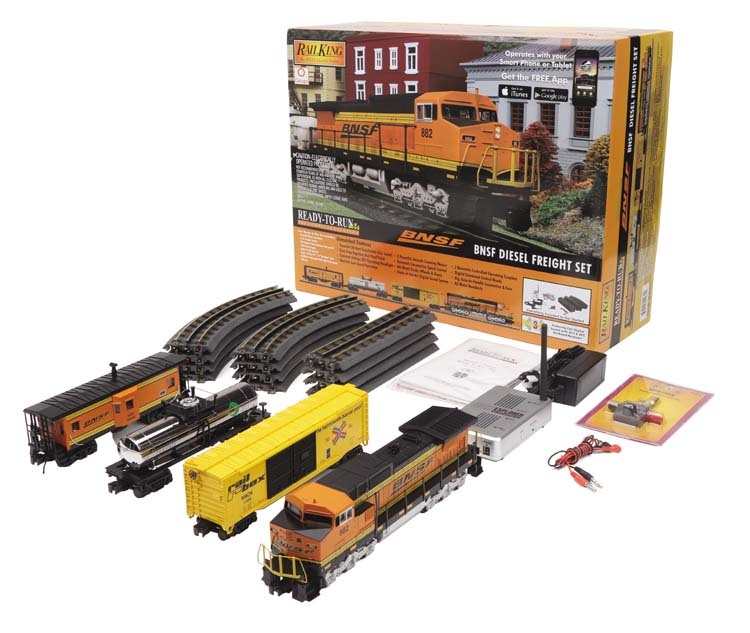 Capture the high-horsepower drama of modern railroading with this BNSF freight set, headed by our twin-motored General Electric Dash 8 diesel. A best-seller for GE from 1987-1994 and still in wide use today, the Dash 8 helped pioneer computer control of locomotive functions, from engine control to troubleshooting to making sure all 12 wheels were gripping the track and not slipping. Our model features an LED headlight to light up the night; Proto-Speed Control for smooth, steady speeds from a crawl to full throttle; traction tires for tremendous pulling power; and a full range of sounds from blaring horn and clanging bell to diesel motor, squealing brakes, freight yard sounds and crew conversations.